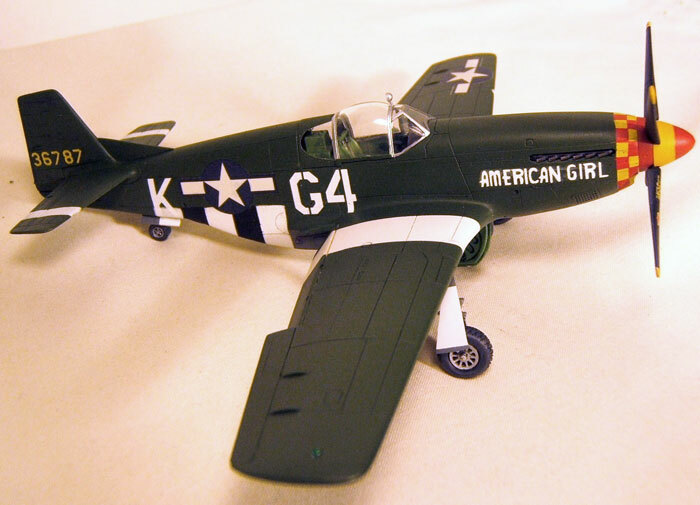 The P-51-B Mustang coded G4*K as flown by 1st LT. Alden E. Smith which he named AMERICAN GIRL. (photo supplied by Jim Anderson). This project began when I was a very small boy in the early to mid-1960s. That was when I was introduced to the husband of my mother’s childhood to adulthood friend. He was Alden E. Smith. At that time, he was a Vice President at the bank, with which my parents had the mortgage to our house. His family and my family would go for rides on my family’s twenty-five foot cabin cruiser Happy Tim and have some really fun times. One day, Mary, my mother’s friend told me that Alden flew P-51 Mustangs and even flew with Chuck Yeager. To a small boy who idolized (and still does) fighter pilots, that was all that a little boy needed to hear. From that day forward, Alden was a hero to me. Also, from then on, he was labeled “the Red Baron” by me. He would often let me wear his officer’s cap, which had the typical twenty-five mission crushed look to it and he even put his leather flight helmet on me once, complete with the oxygen mask. I won’t ever forget that! As I think back on it, the helmet had the RAF style goggles. He showed me his USAAF Type A-2 leather flight jacket once. I heard that those were passed on to his son or youngest daughter when he died in the late 1980s or early 1990s. His son made me a VHS tape copy of Alden’s gun camera film. I thoroughly enjoyed watching that tape until the time that my father accidently taped over it. It clearly showed him achieving more than the four and a half confirmed victories and three probables which he’s officially credited with. I counted eight victories. His last mission was almost just that, his last one. Two Bf-110s bounced him from out of the sun, and shot him up pretty badly. He was extremely lucky to get back to base. His neck injury was severe enough to send him home to the States. He still had the shrapnel imbedded in his neck to well into the early 1980s when he finally had it removed. Even though he’s gone, I can still hear him telling a story saying, “… and, I turned around, and I turned around and I turned around …” And, seeing him holding onto the mast of our sailing dinghy as it slowly sank under him and my mother not allowing him back on the Happy Tim because he stank of river stink. 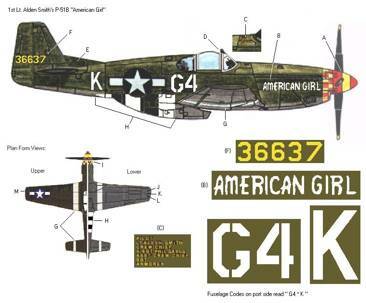 One day, I did a Google search and I found, through sheer happenstance that there was an out-of-production decal sheet that had as an option, markings for a P-51-B Mustang with the aircraft code of G4*K with the nose-art of AMERICAN GIRL flown by 1st LT. Alden E. Smith in the summer of 1944. The decal sheet for Alden Smith’s AMERICAN GIRL. After he was sent home due to his injuries, the plane was handed off to another pilot and was named RUBBER CHECK. (Jim Anderson). 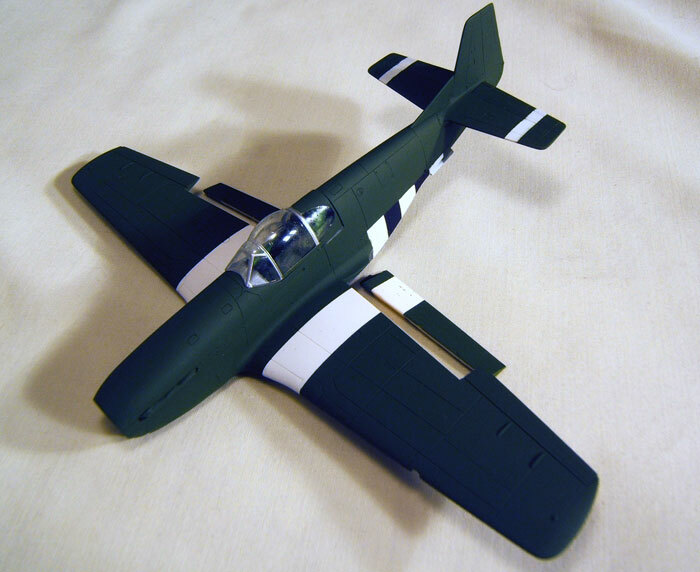 I knew that I had to have that sheet, even if I never had a model of a P-51-B built or not. Just having a decal sheet which had Alden’s name on a plane would be enough. So, I began a search for that sheet, and that search led me, in a totally round-about way, to an internet site dedicated to the USAAF’s 357th Fighter Group and all of its squadrons managed by Jim Anderson, son of “Bud” Anderson, the ace who flew OLD CROW and who is a friend of General Chuck Yeager who is another ace who flew GLAMOROUS GLENNIS. Mr. Anderson answered my inquiry and indicated that he had the decals that I was looking for and that he would send them to me, with the proviso that I send him photos of the completed model, which I agreed to do. 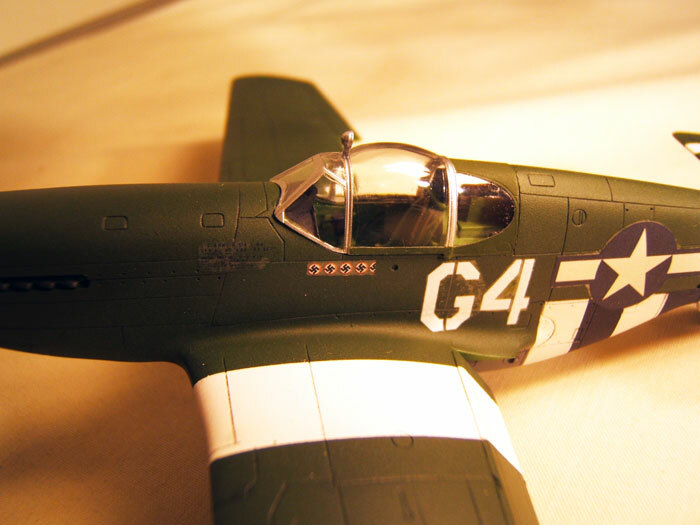 Now, I had the decals, all I needed was a 1:72 kit of a B model Mustang! 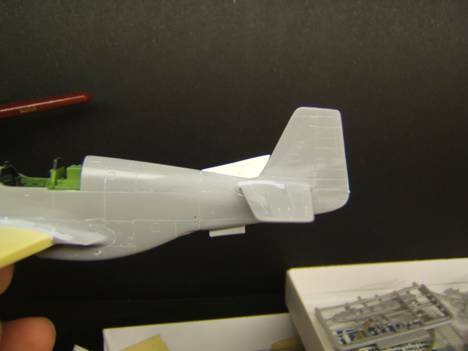 Since, Alden’s plane had the ‘Malcolm hood’ style of canopy, the only game in town in 1:72 is the Academy kit. I bought one. I had the decals, the kit. All I need was someone to build the model. That requirement was met by Bob Cicconi. I told Bob that I had the kit and the decals and I was going to have my brother mail everything down to him. He told me that all he would need me to send would be the decals, as he had the same exact kit in his stash. Maybe I’ll have my kit built up as DING HAO! – or – as PEG’O’MY HEART. The build would basically be an out-of-the-box build. However, Bob was kind enough to give me a set of resin wings from Hawkeye Designs which he told me had deeper wheel-wells and that the wings had the correct shape of the wing which was correct for the B model of the Mustang. Bob also supplied a seatbelt and harnesses from Eduard because they could be easily seen through the closed canopy. 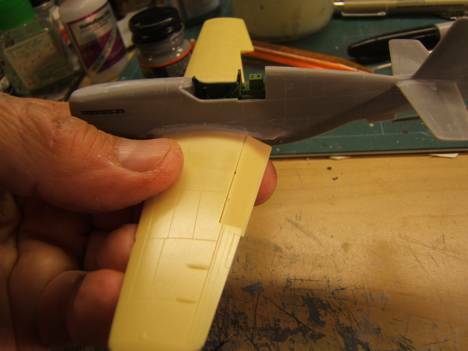 He made the spinal fillet out of sheet plastic and then, shaped it to fit into the fuselage, the real G4*K had one. Bob also gave me a set of resin “flattened” P-51 wheels from True Details as well. What started out to be a straight-forward out-of-the-box build turned into something nice. 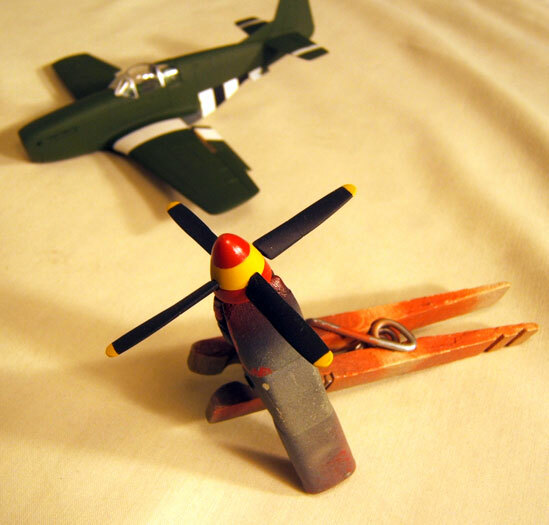 I just wanted a model of the plane that a friend flew, and I was actually getting one, and from a truly excellent modeler. He then began the painting process, he also hand painted the D-Day markings instead of using decals. Now, it is beginning to look like a Mustang. 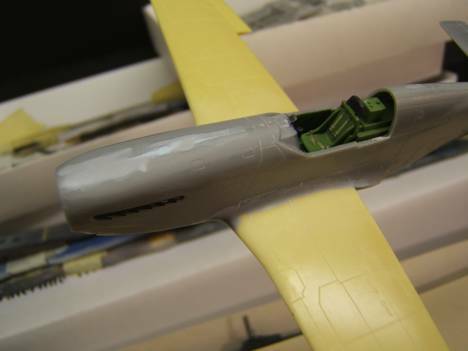 The underside of the model was painted Gray and the topside was painted Olive Drab. 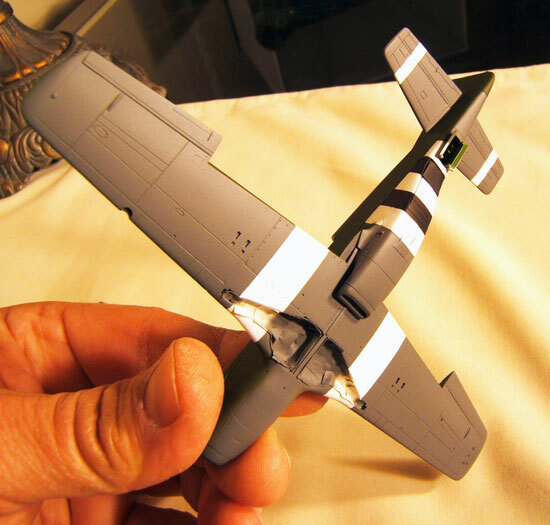 Bob then turned his attention to the propellers and the spinner and they were finished to matched the colors of the 357th Fighter Group’s markings. The model neared completion as Bob started to apply the decals. At this time, I would like to interject something regarding Alden’s record. There are three sources that give you three different tallies of how many victories he scored. One, which I don’t really put too much stock in, is a book which was published just at the war’s end or just after the war, since there is a 1945 publication date on it. The book is entitled Fighters Up. The list in the book (which Alden gave to me as a little boy and which my father would read to me before I went to sleep, (and, when I was in my late twenties, I was lucky enough to have the late Colonel Francis “Gabby” Gabreski sign it – he was one of the top American aces in the European Theater in World War II and a personal hero of mine) states that Alden was credited with five victories, thereby classifying him as an ace. Until I became acquainted with Jim Anderson (who is the son of the noted ace of Colonel “Bud” Anderson) and the now deceased Merle Olmsted, the historian of the 357th Fighter Group, I did always believe that Alden was a real ace. However, Mr. Olmsted told me that his records showed that Alden was just credited with two and a half victories. The decal sheet which I had Bob used had two and a half victory markings for AMERICAN GIRL as flown by Alden. At the same time which I was corresponding with those two gentlemen, I was also in touch with the Air Force Museum in Dayton, Ohio. The museum was kind enough to send me their records of Alden’s victories. Their spreadsheet clearly indicated that he had four and a half victories. So, I decided to have Bob put four and a half kill markings on the plane. Again, I would like to interject something here; when I was looking at the spreadsheet from the Air Force Museum, I was intrigued by the fact that all of Alden’s victories were achieved in what is considered the early evening. I was seeing times like 1745 hours and 1815 hours (5:45 PM and 6:15 PM respectfully) until I remembered something from my trips to England, and that was it remains light to very late at night over there. Bob stated that the decals went on without any trouble, other than for a little silvering, which is barely visible, well at least to me. Since this model is for my own enjoyment, and that it will never be entered in a contest that will not matter. Bob did not weather the model as per my request, but, he did apply a wash to highlight some of the recessed lines. The four and a half kill markings on the model. They were scrounged up by Bob Cicconi. I must say, the finished model is far beyond my wildest expectations for the model, and I am not just saying that. It really is much more than I thought it would be. I now have a model of a plane which was flown by a man who was a true hero to me. It is also a good example of when good competent and thorough research, coupled with the advanced skills of an excellent modeler can and does result in a really fine looking and highly accurate model. Now, when I look at the model, I can really hear Alden saying, “… and I turned around, and I turned around and I turned around …” Thanks to Bob Cicconi, I now have a perfect way to honor to my own hero, my own ‘Red Baron’.